The company I work for is in the midst of cleaning out a studio location. Most radio engineers are some form of pack rat. I know I have been guilty of this myself, not wanting to throw something away because tomorrow, it might be needed. That was carried out to the extreme at this location. 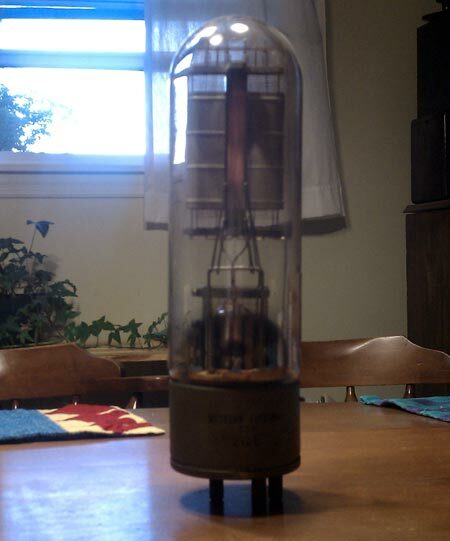 One of the things that I found in my clean out was a Western Electric 212E vacuum tube. It is an impressive thing, measures about 12 1/2 inches tall, including the pins. I am thinking this is pretty old, it probably came from a pre-WWII Western Electric AM transmitter. This would make the most sense, as the station signed on in 1926 with 250 watts. Back in the day, Western Electric was the patent holder for AM technology. In fact, there was some talk of suing General Electric for patent infringement after the airing of the world series by WJZ and WGY in 1922. Parent company AT&T was working on radio modulation techniques to implement with their telephone system. These tubes were used for audio amplification, according to the spec sheet, the plate could dissipate 275 watts. Filament voltages is 14 volts at 6.2 amps, the plate voltage was 3,000 volts, maximum. It is a tetrode. The RF counterpart to this tube is the WE 308A. From what I am to understand, these have not been made since 1960 or so. I also understand there there is quite a cult following for this tube amongst Asian audiophiles. 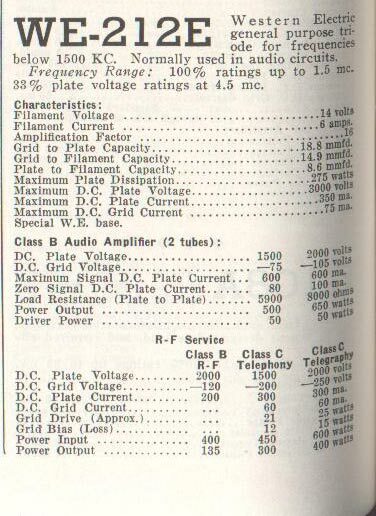 There are several examples of extremely low distortion class A and AB amplifiers using this tube type. Some prices on Ebay are in the $1,500 to $2,000 per tube range. Unfortunately, I don’t think this one works anymore as there is a loose screw and little bits of what looks like control grid wire in the bottom of it. It does light up with 12 volts on the filament, however. This is standard telephone company stuff, however, it would seem that several radio engineers have forgotten this. I was reading on one forum where an AM station was using 1000 feet of 12 gauge romex to send audio from the studio to the transmitter out back. The owner was complaining that the audio sounded bad. 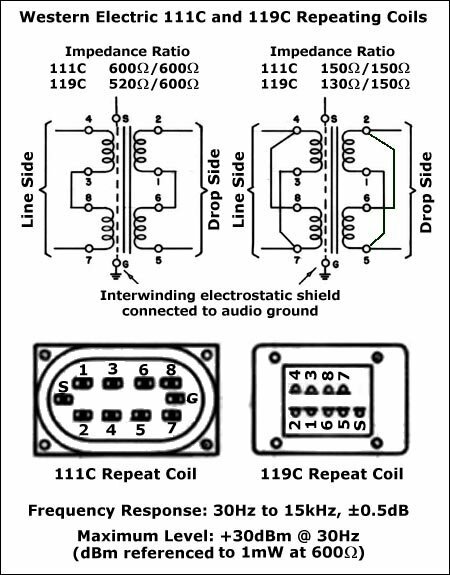 Longer wire runs need to be terminated with the characteristic impedance of the cable being used, normally 110 ohms or so for typical audio wire. This is because impedance mismatches can cause return loss just like in an RF circuit. Exactly what the effect of the mismatched impedance depends on the length and frequencies involved. On shorter cable runs of less than 100 feet or so, this usually is not an issue. 1. Transformers are often used to match the impedances of circuits. A transformer converts alternating current at one voltage to the same waveform at another voltage. The power input to the transformer and output from the transformer is the same (except for losses). The side with the lower voltage is at low impedance, because this has the lower number of turns, and the side with the higher voltage is at a higher impedance as it has more turns in its coil. Western Electric 111C audio transformers were often used in equalized TELCO circuits sending audio over long distances on copper pairs. 2. Resistive network impedance matches such as H or T or L pads are the simplest to implement. They limit the power deliberately, and are used to transfer low-power signals, such as unamplified audio or radio frequency signals. Almost all digital circuits use resistive impedance matching which is usually built into the structure of the switching element. 3. Active balanced converters using opamps with high input impedances (10 Kohm bridging resistance) that first greatly reduce the voltage, then amplify it are often used an audio circuits. They have the advantage of active gain control and are often used in conjunction with gain reduction and limiting circuits. The above diagram shows an active unbalanced to balanced audio converter. The advantages of such a circuit are active gain controls can be added to set levels. With additional feedback circuit elements, it can also be used for automatic gain control, gain reduction, limiting and so forth. For most inter and intra studio wiring, professional audio equipment is designed for 0 dBm 600 ohm balanced audio (AKA line level audio). Audio cable such as Belden 8451 or like multi-pair cables terminated on punch blocks or connectors works well. Cable impedances and matching are generally not a design consideration. Long cable runs, longer than 150 feet or so, do need to be terminated in a high quality audio installation.